DiversaCut 2110A® Dicer - Urschel Laboratories, Inc. Accepts Products up to 10"
Accepts up to a 10" (254 mm) infeed product! 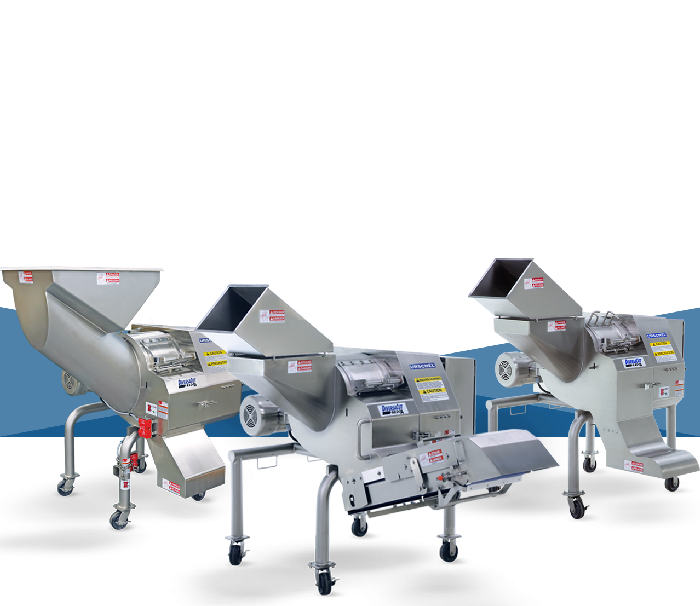 The DiversaCut 2110A™ Dicer dices, strips, slices, granulates, and shreds at high production capacities. With a maximum infeed of 10" (254 mm) in any dimension, the machine offers cost-savings by eliminating the need to pre-cut product. This new dicer promotes more precise cut tolerances with slice adjustment and lockdown features. The machine also features fine-tuning through adjustable collars on both cutting spindles for ultimate precision. 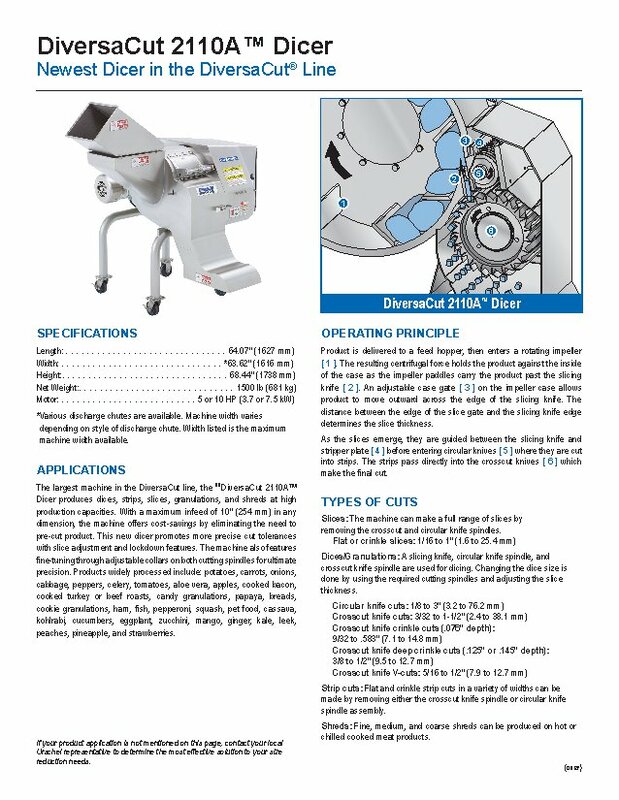 The largest machine in the DiversaCut line, the DiversaCut 2110A™ Dicer produces dices, strips, slices, granulations, and shreds at high production capacities. With a maximum infeed of 10" (254 mm) in any dimension, the machine offers cost-savings by eliminating the need to pre-cut product. This new dicer promotes more precise cut tolerances with slice adjustment and lockdown features. The machine also features fine-tuning through adjustable collars on both cutting spindles for ultimate precision. Products widely processed include: potatoes, carrots, onions, cabbage, peppers, celery, tomatoes, aloe vera, apples, cooked bacon, cooked turkey or beef roasts, candy granulations, papaya, breads, cookie granulations, ham, fish, pepperoni, squash, pet food, cassava, kohlrabi, cucumbers, eggplant, zucchini, mango, ginger, kale, leek, peaches, pineapple, and strawberries. View this video featuring the DiversaCut 2110A (DCA) producing vegetable noodle cuts. Product is delivered to a feed hopper, then enters a rotating impeller [ 1 ]. The resulting centrifugal force holds the product against the inside of the case as the impeller paddles carry the product past the slicing knife [ 2 ]. before entering circular knives [ 5 ] where they are cut into strips. The strips pass directly into the crosscut knives [ 6 ] which make the final cut. The machine can make a full range of slices by removing the crosscut and circular knife spindles. A slicing knife, circular knife spindle, and crosscut knife spindle are used for dicing. Changing the dice size is done by using the required cutting spindles and adjusting the slice thickness. Flat and crinkle strip cuts in a variety of widths can be made by removing either the crosscut knife spindle orcircular knife spindle assembly. Fine, medium, and coarse shreds can be produced on hot or chilled cooked meat products.